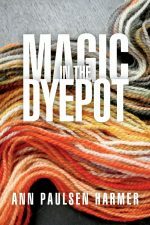 It’s time I started doing something about my stash – well, some if it, anyway – so I gathered up all the bits and pieces of roving that went through the dermocybe dyepots over the last two years. I found I had two kinds of wool: soft, silky Merino (the pile on the left) and coarser Corriedale (right). The Merino, which felts more easily anyway, has a lot of little slubs throughout – if I dye with it again, I’ll have to be more careful not to move it around too much when it’s in the hot dyebath. 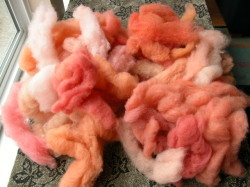 I hand-carded the wool, to open up the fibres and line them up for spinning. My plan is to spin one bobbin of Merino and one of Corriedale, then ply them together, thus getting the best of both wools. I’ll put the colours together at random, so when the yarn is finished, it should be an interesting blend courtesy of the little Cortinarius that grow in the woods around us.